This edited volume builds on substantial insights from gender and disaster scholarship around the world, most of which has focused on women’s perspectives and women’s disadvantage, to explore in greater depth the diversity of men’s experiences during disasters, both from natural hazards or ‘human-made’ hazards. Employing lessons learned or identified from women’s studies, the work does not assume that men and masculinity are homogenous or stagnant categories. Rather, it illuminates how intersecting factors such as age, race, sexuality, ethnicity, class, and (dis)ability affect men during disasters in a variety of different social contexts – in the home, community, workplace, and institutions – and provides a better understanding of how exactly gender inequalities are (re)produced during disasters. Utilising research on men and masculinities undertaken during different types of disaster, and in different geographical locations, the influence of different social cultures and attitudes to risk is evidenced. This book additionally delivers timely new theoretical insights regarding gender-based violence, and the gendered nature of climate change impacts. The book’s chapters are organised into four sections. Unfortunately, space does not allow for a discussion of every chapter included, so I will focus on two or three from each section. The first section of the book, ‘Critical Men’s Studies and Disaster’, illustrates, from different social perspectives, the way masculinity is (re)constructed though a variety of mechanisms. The introductory chapter by editors Elaine Enarson and Bob Pease lays out the rationale for an intersectional approach, and together with the preface by Kenneth Hewitt, makes the case for the need to consider men and masculinities in disasters. Rachel Luft’s analysis of male volunteers’ and decision-makers’ experiences in the recovery process reveals the power hierarchies between different men, and provides specific examples of how (and which) women get left out of decision-making; the holding of meetings at night in bars, passing over mothers for leadership positions, and the de-prioritising of sexual assault, for example. In his chapter, Bob Pease critically assesses the gendered nature of the causes of and responses to climatic events around the world. In an examination that ranges from everyday behaviours such as meat consumption (men on average consume more meat than women, and meat production significantly contributes to climate change), to the largely technocratic, male-dominated arena that characterises global environmental policy – and the related, historical identification of the exploitation of nature as a ‘masculine’ activity, Bob Pease convincingly argues for a pro-feminist approach to environmental protection and advancing gender equality. Duke Austin investigates ‘hyper-masculinity’ and disaster, looking at what happens when certain institutional and organisational supports are stripped away from men, or weakened during disasters. This chapter gives the reader new understanding of how different social structures (economic, institutional, etc.) influence masculinity and specific disaster issues such as gender-based violence, which often increases during disasters. Duke Austin’s observations suggest that greater attention to interacting structural influences on men’s behaviour is required to understand the root causes of violence, something that may not be examined closely enough in gender-based violence prevention efforts for disasters. 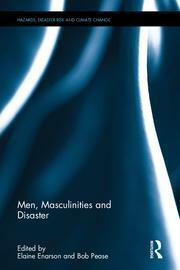 Section Two looks at the costs and differential impacts of disasters on men and masculinities. Two chapters consider men’s experiences in Australian wildfires; Christine Eriksen and Gordon Waitt examine the narratives of men who fight wildfires, and Debra Parkinson and Claire Zara investigate the emotional and personal costs to men from the ‘Black Saturday’ bushfires of 2009. Different levels of individual and collective hyper-masculinity in the workplace and in disaster recovery are uncovered, reflecting the unrealistic standards constructed for men, to be stoic and physically strong, and the adverse public health impacts of these norms. Malathi de Alwis assesses the mental health costs for minority Tamil and Muslim men in post-tsunami Sri Lanka, who were often portrayed in development and humanitarian aid discourses as ‘alcoholics and wifebeaters’ (p. 93). Examining intersecting factors of age, religion, ethnicity, and class, this chapter shows how harmful gender stereotypes prevented these men from grieving, and impaired recovery, and recommends practical steps to avoid discrimination and facilitate grieving. Section Three takes into account the diversity of men’s experience in the context of disasters, with chapters on men with disabilities, indigenous masculinities in the USA, the male youth experience in Canada and the USA and, taking us beyond the gender binary, a chapter on LGBT experiences in the 2011 Brisbane floods in Australia. In the narratives of disabled men and LGBT persons during disasters, the chapters by authors Mark Sherry and Andrew Gorman-Murray, Scott McKinnon and Dale Dominey-Howes, respectively, illustrate power hierarchies between men, and demonstrate the dynamic nature of masculinity. Practical advice for improving support services such as warnings, transportation, medical care, evacuation, and shelters, often inaccessible to, or hostile situations for, disabled and LGBT men, is outlined. In their chapter on Native American masculinities and climate change, vulnerability, and resilience, Krysten Vinyeta, Kyle Powys Whyte, and Kathy Lynn draw out comprehensive linkages between gender, climate change and disasters, and highlight further complexities in the gendered nature of disaster impacts for indigenous communities. As the authors explain, indigenous livelihoods have been traditionally gendered, with men’s livelihood activities particularly tied to hunting and fishing – activities threatened by climate change and a concomitant increase in men’s exposure to hazards (p. 146). Section Four takes as its focus transforming masculinity in disaster management. Chapters by Mathias Ericson and Ulf Mellström, and Dave Baigent explore firefighters’ reactions as technology and gender policy transform the workplace. Mathias Ericson and Ulf Mellström describe the way new technologies can create opportunities for both men and women, reducing the physical strength required to achieve certain tasks, and making certain tasks more efficient. This can enable a more proactive, as opposed to reactive, approach to firefighting, for example, making time for greater community training. However, as Dave Baigent relates, women’s integration into firefighting has also sparked resistance between men themselves, and among men and women, posing new management challenges. Kylah Genade considers the potential leadership of men’s organisations in Southern Africa in climate- and disaster-risk reduction, emphasising the interdependence between men and women, and the success of male-led efforts to change men’s negative attitudes and behaviours towards women. Concluding this section, the final chapter by Elaine Enarson provides an action research agenda for incorporating a focus on men and masculinities into disaster planning. The book is suited to practitioners and researchers in the fields of development, humanitarian response, emergency and disaster risk management, and public health, delivering practical advice for decision-makers. While academic language is at times a challenge, there is a balance between contributions from academics and from practitioners in each section, ensuring that the central messages of the book are clear. Many important linkages to climate change are drawn, although I would say that overall, the connections between hazards, disasters, and climate change are not consistently emphasised through the book. As the afterword by Raewyn Connell argues, collectively, the contributions in the book provide readers with a rich intersectional analysis of gender and disasters, applying a variety of social perspectives, and employing a wide range of methodologies. Men, Masculinities and Disasters clearly illustrates the need for an understanding of men and masculinities in all climate and disaster planning, and through its exposition, helps make this a more achievable aim.